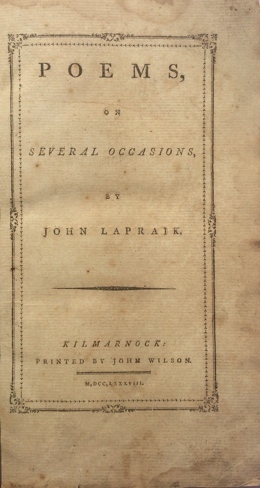 A book of John Lapraik's Poems and Songs was published in 1788 by John Wilson of Kilmarnock. That material has now been re-published - see the Table of Contents. The cost of publishing the book was paid by those Subscribers willing to invest their money - in the hope that the book sold well and they would thus get a return on their investment. The book begins with a Dedication in verse which seeks to explain why the author does not feel it appropriate to dedicate the book to anyone specifically and instead wishes it to be to the "Partial Public" who would buy his book. Although it isn't directly mentioned, it would have been well known that Lapraik had been imprisoned for debt following the collapse of a local Bank a few years earlier and it would have been obvious that the publication was done in the hope that it would be a commercial success to assist in regaining a degree of financial stability. A full list of all the Poems and Songs is set out in the Table of Contents.